The great Japanese manga and anime master, Hiyao Miyazaki, is adapting Ursula Le Guin's Earthsea books into a film, which is great news, not least of all because it should prevent lesser film-makers from touching them. Le Guin's Earthsea books (for a long-time a trilogy, then more recently a quartet, at last count five books plus a volume of short stories) are, in my opinion, modern literary masterpieces. The fantasy genre is overrun with inferior hack writers and pilfered ideas, but Ursula Le Guin can really write - beautiful, evocative prose with finely developed characters, a real sense of place, and the ability to surprise and take away your breath with a sudden change of direction, at once startling, but also beautifully fitting. So often it seems there are ideas whose time has come, and they spring to imaginative life simultaneously in different places at once. 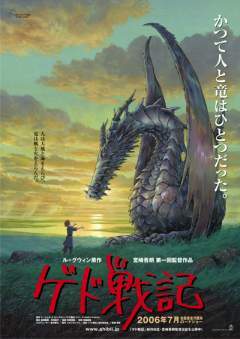 For me, the idea of Miyazaki developing the Earthsea tales in a manga/anime style is absolutely ideal. A few years ago I developed Children of the Moon, a continuing four part fantasy about elves, dragons and death, drawn in a manga style and published in the anthology, Xuan Xuan. That style turned out to be ideal for the subject matter and clearly brought out the (fairly esoteric) ideas I wanted to convey. I anticipate that the film of Tales from Earthsea will be among Miyazaki's finest work and do great justice to Ursula Le Guin's enduring classic. Not Hayao Miyazaki, but his son Goro. This is his first animation work, and his father is apparently not wholly in favour of him doing it. Thanks, Greg, that is fascinating - I'd love to know more about this. I thought it was odd that the previous film, Howl's Moving Castle was based on an existing novel, otherwise this would have surprised me more... but his son - I hadn't expected that. By the way, I've always thought that J.K. Rowling may have got a lot of her ideas from the novels of Diana Wynne Jones (author of Howl's Moving Castle) - a far superior author, in my opinion.